Places to kayak and canoe in London. A kayaker approaches Carthagenal Lock on the River Lea, just north of London. London’s once bustling canals now offer a delightful way to discover hidden backwaters and get close to a surprisingly rich variety of wildlife. A British Waterways permit is required to paddle London’s canal system – see our page on Access and Licences. Bear in mind that if you fall into a canal it can be very difficult to get out without assistance, as the canal walls are often vertical and the water deep. The Thames is tidal through most of London, with a rise and fall of up to seven metres (23 feet) in the heart of London, where the river is squeezed between high river walls. Tidal rivers generally have free public navigation, but with tidal flows of up to five miles an hour the tidal Thames is not the place for an inexperienced kayaker or canoeist. However, several kayak clubs actively paddle on the Thames, and will ensure that inexperienced paddlers can go out under the guidance of experienced coaches or leaders. Above Teddington Lock, the river Thames is no longer tidal and access is controlled by the Environment Agency. Your boat should be registered with the agency if you wish to paddle here. The registration cost was £30 in 2011. Alternatively, membership of the British Canoe Union (BCU) automatically includes an Environment Agency permit. Most London clubs hold a BCU licence which will cover their club boats, and many paddlers hold personal BCU membership (£37 in 2011). There are many beautiful sections of river here, and the gentle flow allows the paddler to explore both up and down the river. The River Lee originates in Hertfordshire. It flows past Waltham Abbey and the site of the Lee Valley White Water Centre before entering East London. At Bow Locks the river splits, with a tidal section continuing to the Thames along Bow Creek, whilst the rest of the river diverts into the Limehouse Cut, which takes it to Limehouse Lock where it joins the Thames. The River Lee and Limehouse Cut section are managed by British Watersways and, as long as you have a licence (see above), you are entitled to paddle on any section of this waterway, throughout the year. The short tidal section comes under the management of the Port of London, is infrequently paddled and is only for experienced paddlers, who are familiar with tides and the committing nature of the walled in river. Many rivers and streams used to flow into the Thames, but as London has grown these waterways have been swallowed up and built over. Perhaps the best known of these lost rivers, the River Fleet, used to flow from Hampstead Heath, past Kings Cross and the old livestock markets at Smithfield, before joining the Thames where Blackfriars Bridge now stands. It was said that a fleet of boats could once moor in the mouth of the Fleet, but now all that is left is a single storm drain below the bridge. Some rivers have survived, such as the Wandle and Ravensbourne, but navigation is difficult and the weirs and tidal sections can present significant problems for the urban paddler. 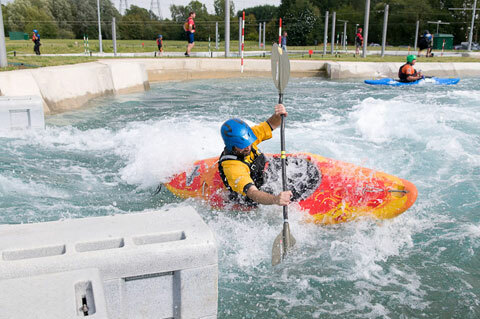 Two brand new white water courses have been built at Lee Valley for the London 2012 Olympics. The Olympic course provides 300 metres of fast, furious, Grade Four water and the smaller Legacy course provides 160m of demanding, Grade Three white water. Both courses are open to the public, but kayakers and canoeists must take a competency test before being allowed to use the courses. The Olympic course is also open for rafting. For more information see the Lee Valley White Water Centre website. Most lakes and reservoirs in London are closed to kayakers and canoeists, except when a club has private access. There is a wealth of beautiful countryside around London, and what better way to explore than in a kayak or canoe? British Waterways have provided an excellent resource on their Waterscape website allowing you to download an up-to-date map of every British Waterways canal and river in England and Wales. To download your map, visit the Waterscape website. A British Waterways permit is required to paddle these waterways – see our page on Access and Licences. Canoe England have produced a series of Canoe Trails, which make an excellent starting point for those who want to get out on the water. The Canoe Trails can be downloaded from the Canoe England website. A similar series of guides entitled ‘100 Paddles in England’ has also been published by the British Canoe Union and is available as a PDF file from their website. Click on the following link to download or read ‘100 Paddles in England‘. Check out the online river guides and forums at the UK Rivers Guide Book – it is an essential guide to kayaking and canoeing in the UK and beyond. AINA have produced a map showing those waterways maintained by British Waterways, the Environment Agency, the Broads Authority and other AINA members. Most of these rivers will be open to kayakers and canoeists, providing they have a permit. Click here to view or download the map. For information on permits, see our page on Access and Licences. White water rivers tend to need plenty of rain to bring them up, but these locations run throughout the year, providing white water thrills in both summer and winter. Cardiff White Water Centre. Artificial course of 250 metres offering grade 3 white water. Tees Barrage Recently refurbished artificial course offering 350 metres of grade 3 white water. Holme Pierrepont Artificial course near Nottingham offering 700 metres of grade 3 white water. Mile End Mill Good introductory spot to white water on the River Dee just outside Llangollen in North Wales. Nene Whitewater Centre, Northampton Small grade 2/3 artificial course for playing and training. Tryweryn Dam controlled river with frequent canoeable releases each year. Two sections provide grade 2/3 and 3/4 white water rafting and kayaking.